Gajar ka halwa is one of the most popular Indian desserts. 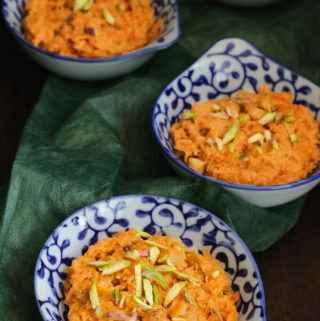 In English, gajar ka halwa is closest to carrot pudding made with grated carrots, cooked in milk with sugar, and cardamom, and sprinkled with dry fruits. Carrot halwa is enjoyed both as a hot and a cold dessert. In our house itself, we have different preferences. I enjoy the halwa cold while Sikander loves it hot. And to top it up, he would serve the hot carrot halwa with cold vanilla ice-cream. What is your favorite way of eating carrot pudding? This is the original gajar halwa recipe without condensed milk, milkmaid or khoya. Traditionally this carrot pudding is made in India during winters when the sweet red carrots are in season. Every household will almost have a steady supply of gajar ka halwa during winters. Every Sunday, mom used to make carrot halwa with almost 2-3 kgs of fresh carrots and it would last for 5-6 days between the 4 of us. The halwa can be easily stored in the refrigerator for up to a week. We used to have it for breakfast, after lunch & dinner, and for a snack! I have been asked if gajar ka halwa is healthy? Now that’s like asking if any dessert is healthy. Of course, this recipe is without the processed products like condensed milk or shop bought khoya which comes with its own additives. But well it does have sugar and I don’t think I can classify sugar as particularly healthy. Though for gajar ka halwa without sugar, you can use dates, like I did in the sugar-free sheer khurma recipe. This is the recipe that has been passed on from generations before me. It takes time to cook it. My grandmother used to say that would keep the carrot to cook on a very low flame and meanwhile cook the entire meal. 🙂 Since it is such a favorite, I have to try a vegan gajar halwa recipe using almond milk and no ghee. Sometime soon! 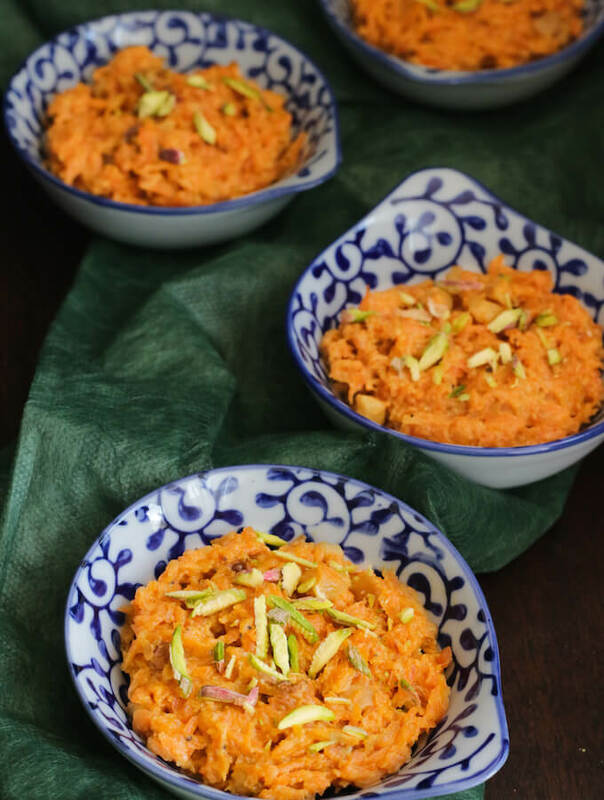 Gajar ka halwa or the Indian carrot pudding is one of the most popular Indian desserts. Grated carrot is cooked in milk with sugar, cardamom, and raisins, and sprinkled with dry fruits. It is enjoyed both as a hot as well as a cold dessert! This recipe is without the use of khoya or condensed milk. Take out 2 tbsp of milk in a small bowl and add in the saffron strands. While the milk is boiling, wash, peel, and grate the carrots. In a big kadhai/ wok, heat ghee. Add the grated carrots. Stir and cook covered for about 10 mins. To the carrots, now add the boiled milk. Mix well and let it cook, with occasional stirring, for about 30 mins till the carrots are cooked and the milk is reduced to ⅓rd. Now add the sugar, saffron milk, raisins and half the cardamom powder. Mix well and continue to simmer on low heat for another 5-10 mins till the carrot halwa becomes thick and all the milk has evaporated. Mix in the remaining cardamom powder, garnish with green pistachios and serve hot. Or let it cool and chill in the refrigerator for at least an hour before serving it cold. *A simple trick to heat milk without it spilling over is to put a wooden spoon in the pot. Ghee is optional, it is not necessary to cook the carrots but it adds to the traditional taste. Gajar halwa is my all time favorite dessert. I can eat this at any time of the day. Yours look so delicious. Thank you so much, Avin! Definitely a classic. Wow gajar ka halwa looks super tempting. A drool worthy share. Same here. Different preferences to eat gajar halwa. I like it cold but my daughter likes it hot with a dollop of ghee. 🙂 Thanks, Sujata! Loved to read that you have different preferences in your home too! Drooling here. A delicious old classic that is still something anyone will enjoy. Nothing can beat this traditional carrot pudding, i can have this halwa anytime of the day without any fuss. My all time favourite. Thanks, Priya! Surely an all time favorite! yummy Gajar Halwa looking absolutely inviting Ashima, beautiful color, perfect consistency. gajar halwa is my love in winters. I make it on a continuous basis. As soon as it finishes I make another batch. It is almost the same story in our home! During winters there is a bowl of Gajar ka Halwa always ready on the dining table :-). It is beautiful how we all have similar food stories. Thank you so much for dropping by and leaving your feedback. It really encourages me! Gajjar ka halwa is definitely a feel good dessert- gooey, comforting, loaded with that cosy autumn feeling! I like your suggestion of making it with dates for a healthier version. And I’m in love with your presentation and serving bowls. I am still learning food presentations and photography. There is so much to explore in food blogging than just creating and sharing recipes 🙂 I am loving this journey. I am glad you liked the recipe. Dates really do make it healthier than the regular recipe with sugar. Classic Gajar ka halwa looks absolutely irresistible to me, I love its simplicity and flavours. One of my favourite dessert. Thanks, Jagruti! 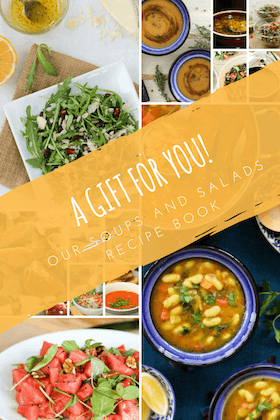 I love experimenting with the traditional recipes a little to see if I can make them healthier or create a fusion dish but some recipes are timeless! Beautiful clicks!! Drooling! An all-time classic, yet we can never get enough of it! Awesome share! I am so glad you liked it. It did take me a couple of different presentation arrangements to finally find the right one :-). Your feedback really encourages me to keep trying! Well, soon the season for Gajar ka Halwa will be back! 🙂 While we make it any time of the year with the orange carrots, I love it best when the halwa is made with the sweet red winter carrots. I can’t wait for the red carrots to show up in the market.